Recent research funded by the Natural Environment Research Council (NERC) has focused on the mechanisms associated with so-called ‘Vulcanian explosions’ at Colima volcano in western Mexico (Cassidy et al. 2015). Such explosions can generate a variety of complex hazards. 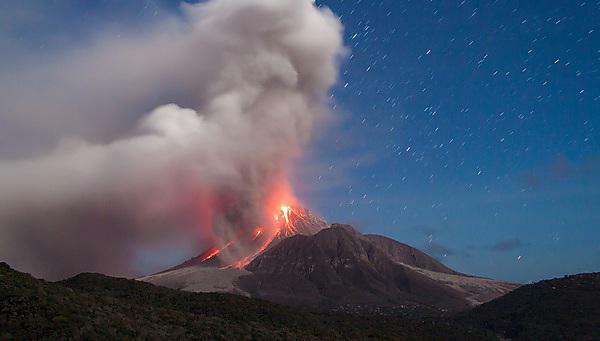 Larger explosions, such as those at Soufrière Hills volcano in Montserrat can generate pyroclastic flows (also known as ‘pyroclastic density currents’), which are lateral currents of ash and gas that have temperatures of up to 600°C and move down the flanks at velocities of up to 300m/s. Other hazards include ash fallout and volcanic mudflows (lahars). Dr Paul Cole is a volcanologist whose research investigates the mechanisms and processes involved in the generation of explosive volcanic eruptions. Such studies are the first step in being able to mitigate against the hazards posed by volcanoes, which builds on Paul’s past role as Director of the Montserrat Volcano Observatory (2009–2012). Find out more about Paul by watching the video. Communication of information regarding the different hazards is essential time-consuming reduce risk to the populations that live around volcanoes. Past research by Paul Cole has mapped hazard and risk using Geographic Information Systems (GIS) but more recent work is exploring other forms of geovisualisation. With PhD student Lara Mani, Paul is evaluating the use of video games as a tool to communicate knowledge about volcanic hazards. The novel use of video games aims to integrate traditional methods of education into the more interactive learning environment of virtual reality, with the idea being that realistic and immersive visual environments might provide more effective ways to improve residents’ knowledge of potential future eruptive hazards (ash fall, pyroclastic flows and lahars). A video game has been developed for the eastern Caribbean island of St. Vincent, using well documented historical eruptions as the scenarios that simulate actual past eruptions and test users awareness of the associated hazard implications. Preliminary findings from testing with local communities on St Vincent provide preliminary support for the notion that computer games can deliver improved hazard awareness in both school students and adults. Serious games, therefore, would seem to be a promising communication and educational technique, but they are not without their challenges. Game development is an expensive and time-consuming process, overcoming software and design challenges in appropriately and realistically visualising the hazardous phenomena. Moreover, although the completed volcano game is not a commercial product, the finished game still had to be fully functional, robust and entertaining to play. Despite all this, video games clearly have the potential to be an effective tool in volcano education and future research at Plymouth will aim to extend this work to other hazard types. The inhabitants of a Caribbean island will soon be able to learn more about the volcano which towers over their homes thanks to a video game created at the University of Plymouth. La Soufrière, perched on the northern edge of St Vincent, last erupted in 1979 while its most deadly blast was in 1902 when 1,500 people lost their lives. Now volcanologists in Plymouth have developed a new educational game, which they hope will enable people of all ages to recognise the signs an eruption may be imminent and to know what to do if such a situation arises. A critical part of raising awareness of volcanic hazard is finding effective ways to convey our scientific understanding of volcanic phenomena to those communities living next to them. As part of the NERC-funded research project ‘Strengthening Resilience in Volcanic Areas’ (STREVA), Paul and volcanologists at the University of East Anglia, the University of Plymouth and Oxford University came up with a novel idea for doing just that: Volcano Top Trumps. Working in partnership with Winning Moves, makers of the world’s No.1 educational card game, the STREVA researchers developed a Volcanoes pack. Based on their expert knowledge, the team ranked some of the world’s most active volcanoes based on six categories – explosivity, deadliness, devastation potential, height, unpredictability and wow factor. The game highlights how much we know about volcanoes, and communicates those serious and important messages in a fun and informative way. As well as a traditional Top Trumps-style card game, an online version also feature two additional games to help build players’ knowledge of the featured volcanoes. You can play the digital version online.